BIGGEST FIGHT CARD IN THE AREA! WILL FEATURE PROS, AMATEURS, BOXING, KICKBOXING, MMA CAGE FIGHTS, ORIGINAL TOUGHMAN BOXING CONTEST. ALL IN ONE GIANT NIGHT OF FIGHTS.. 25 ACTION PACKED FIGHTS IN ALL! 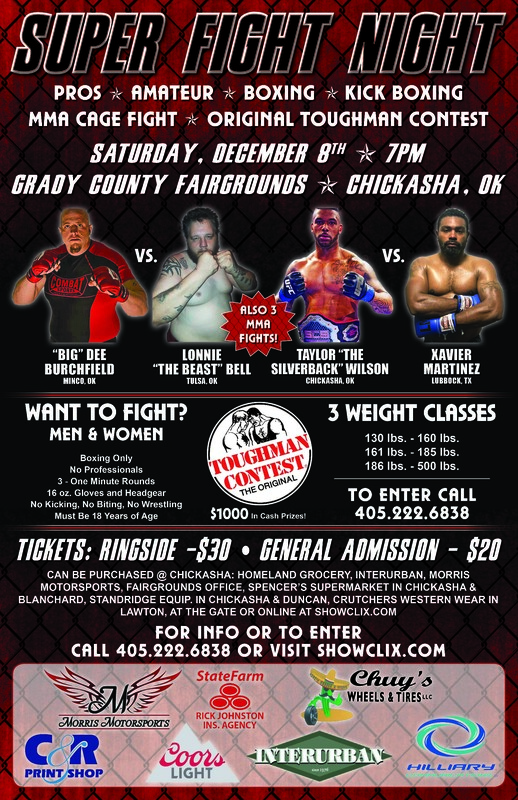 CHICKASHA'S TAYLOR ' THE SILVERBACK' WILSON TAKING ON UNDEFEATED XAVIER MARTINEZ FROM LUBBOCK TEXAS AND MINCO'S 'BIG' DEE BURCHFIELD TAKING ON THE 350LB. MONSTER LONNIE 'THE BEAST' BELL FROM TULSA OKLAHOMA. WILL FEATURE FIGHTERS FROM ALL OVER THE AREA. NO PROS ALLOWED, BOXING ONLY, 3- 1 MINUTE ROUNDS, HEADGEAR. MEN AND WOMEN. SEVERAL WEIGHT DIVISIONS. CASH PRIZES MUST BE 18 ON OR BEFORE FIGHT DAY. HOMELAND, SPENCERS, INTERURBAN, MORRIS MOTORSPORTS, STANDRIDGE EQUIPMENT..IN LAWTON AT CRUTCHERS WESTERN WEAR, IN BLANCHARD AT SPENCERS, IN DUNCAN AT STANDRIDGE EQUIPMENT OR AT THE DOOR. YOU CANNOT PRINT OUT TICKETS. THE WILL BE AVAILABLE AT WILL CALL WINDOW AT EVENT CENTER. RINGSIDE SEATS ARE PULLED AT TIME OF PURCHASE. BEST AVAILABLE. THEY WILL BE ALL TOGETHER! GRADY COUNTY FAIRGROUNDS EVENT CENTER 500 E. CHOCTAW AVE.